Nearly every large corporation and governmental agency is taking a fresh look at their current enterprise-scale business intelligence (BI) and data warehousing implementations at the dawn of the "Big Data Era"…and most see a critical need to revitalize their current capabilities. Whether they find the frustrating and business-impeding continuation of a long-standing "silos of data" problem, or an over-reliance on static production reports at the expense of predictive analytics and other true business intelligence capabilities, or a lack of progress in achieving the long-sought-after enterprise-wide "single version of the truth" – or all of the above – IT Directors, strategists, and architects find that they need to go back to the drawing board and produce a brand new BI/data warehousing roadmap to help move their enterprises from their current state to one where the promises of emerging technologies and a generation’s worth of best practices can finally deliver high-impact, architecturally evolvable enterprise-scale business intelligence and data warehousing. 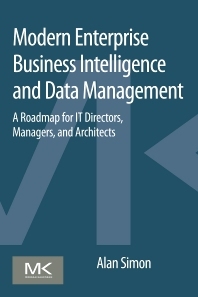 Author Alan Simon, whose BI and data warehousing experience dates back to the late 1970s and who has personally delivered or led more than thirty enterprise-wide BI/data warehousing roadmap engagements since the mid-1990s, details a comprehensive step-by-step approach to building a best practices-driven, multi-year roadmap in the quest for architecturally evolvable BI and data warehousing at the enterprise scale. Simon addresses the triad of technology, work processes, and organizational/human factors considerations in a manner that blends the visionary and the pragmatic. Takes a fresh look at true enterprise-scale BI/DW in the "Dawn of the Big Data Era"
1.2. A manifesto for modern enterprise data management: what are we trying to accomplish?